adapted as "Cowboys & Aliens"
An era when all a man could count on was his horse and his six-gun, and Indians fought a losing battle with European settlers. Until somebody else entered the fight—an invader who saw all humans as slaves, and was determined to conquer our world. 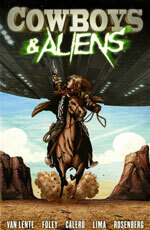 Additional notes: HarperCollins published an updated edition of Cowboys & Aliens in 2011 with new tie-in artwork to the film.